We leave Mt Dare early and head north. 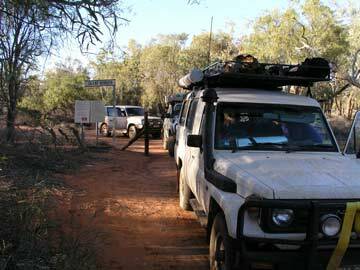 It is about 15 kilometres to the South Australia - Northern Territory border. We continue north and the road is a lot worse than yesterday. We average about 30 kmh. 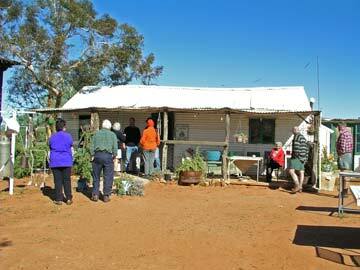 At about 10 am we stop for morning tea, 59 kilometres from Mt Dare. This was after we pass a truck and three utes. We continue on in a northerly direction. After 26 kilometres the road turns north-west and 20 kilometres further along we come to Old Andado. This station was established back in the 1950s by Mac and Molly Clark. Mac died in 1978 in a plane crash and Molly had to not only bring up the children, but run the property. What a character! She is now in her 80s (in 2003) with a very dry humour. She certainly does not suffer fools. Imagine being a female, well over 80 and living by yourself 330 kilometres from Alice Springs. She still drives to Alice to get her provisions ("What, do you think Woolworths delivers out here" she says to one person). Molly says to us as we speak to her "Well, are you going to look inside or what?". We suppose that we had better look inside. 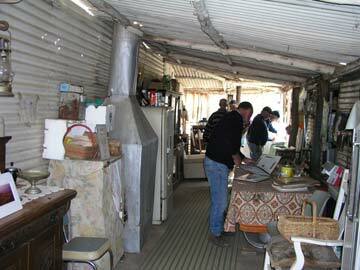 It is original, a fuel stove, kettle boiling away on the stove top, an amazing living museum. 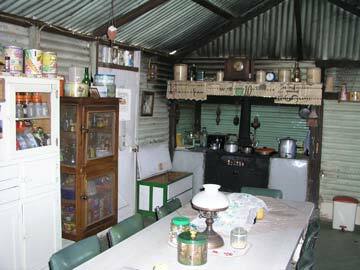 One hopes that when Molly finally leaves us the property is kept as a display of life on the remote land in the middle of the 1900s. 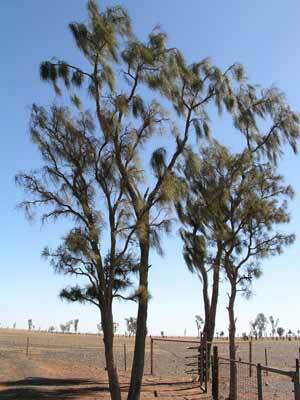 We head north again to Mac Clark Reserve (named after Molly's husband) to see waddie trees, which only grow here and at Birdsville and Boulia. We have lunch here. It is still cool due to the wind which started again about 8:30 am. From here we head on towards Alice Springs. We see no more cars till we pass Santa Theresa Mission. This is over 200 kilometres. The road is not too bad, we average about 70 km/h. We arrive in Alice Springs and go straight to one of the caravan parks. 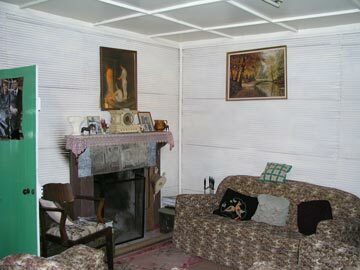 We book into Stuarts Caravan Park, $20 per night. It is not the best park but is centrally located, meaning we can walk into town. We have Indian beef curry and rice for dinner. Temperature 18C but seemed colder. Frank and I go and do some washing at the park's laundry and hang it on the line before we head off. 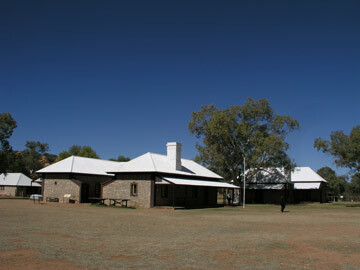 We go to the Anzac Hill lookout which has very good views over all Alice. From here we go to the Old Telegraph Station. This is very interesting. There is a conference of Family Court judges on there and parts are cordoned off. We have lunch on the shore of the Todd River. 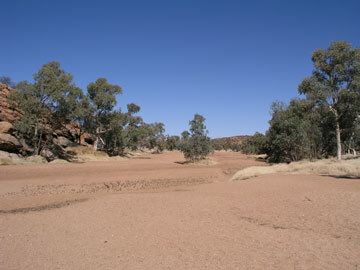 The Todd River is, of course, dry for 99% of the time and once a year is host to the Todd River Regatta, where all the water sports are held on a sandy creek bed. After this we head south out to the Ghan Railway Museum and Truck Museum but it did not look worth entering. We then go up the hill to the west. It is low range and very rough. We can see Pine Gap (the join US Australian defence communications facility) from here. We then head back to the caravan park after refueling at Woolworths. For dinner some of us go to a Thai Restaurant, cost was about $22 plus wine of $6.50. Very good.